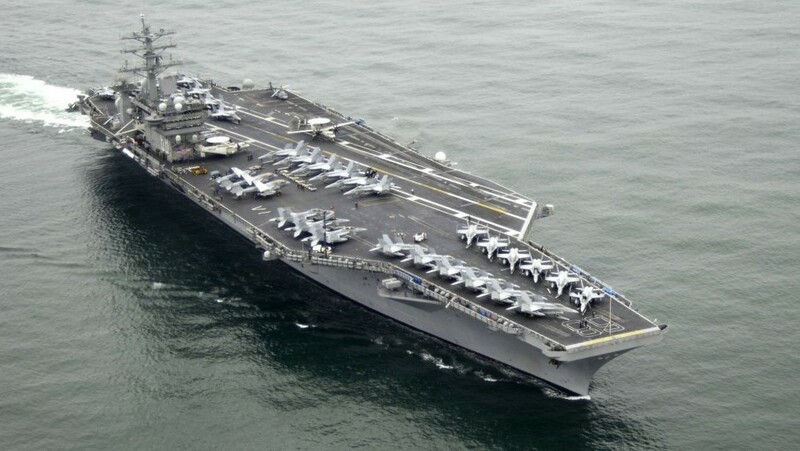 ABOARD THE USS NIMITZ (AP) — High above the Persian Gulf, an Iranian drone crosses the path of American fighter jets lining up to land on the USS Nimitz. The drone buzzes across the sky at least a mile above the massive aircraft carrier and is spotted by the fighters. It is unarmed. But for the senior Navy commanders on the ship, the presence of the enemy drone so close is worrying. Their biggest fear is the surveillance aircraft will start carrying weapons, posing a more direct threat to US vessels transiting one of the world’s most significant strategic and economic international waterways. 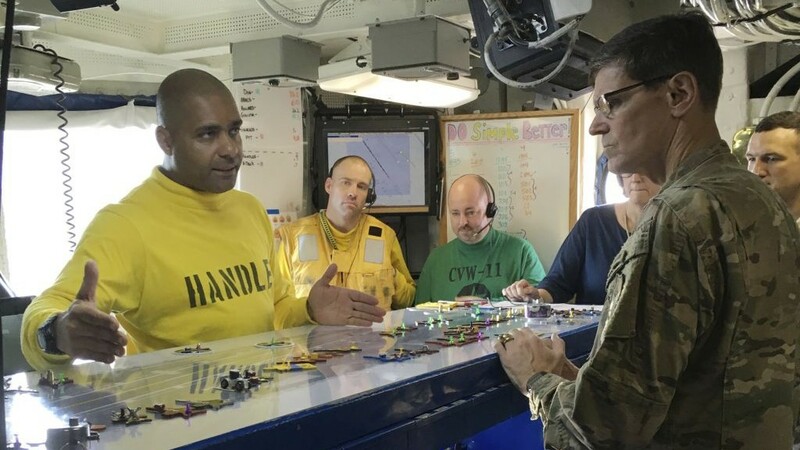 If, at some point, Byrne believes a drone is threatening his ship, he and his staff would have to carefully proceed through the required responses — efforts at communication, sounding the horn, firing flares and warning shots, and flying a helicopter close to the unmanned vehicle. If all those efforts fail and he still perceives a threat, Byrne said it would be his duty, his “responsibility,” to shoot down the Iranian drone. So far, it hasn’t come to that. But the drones have become an even more dangerous security risk as US carriers in the Persian Gulf like the Nimitz play a key role in Iraq and Syria. 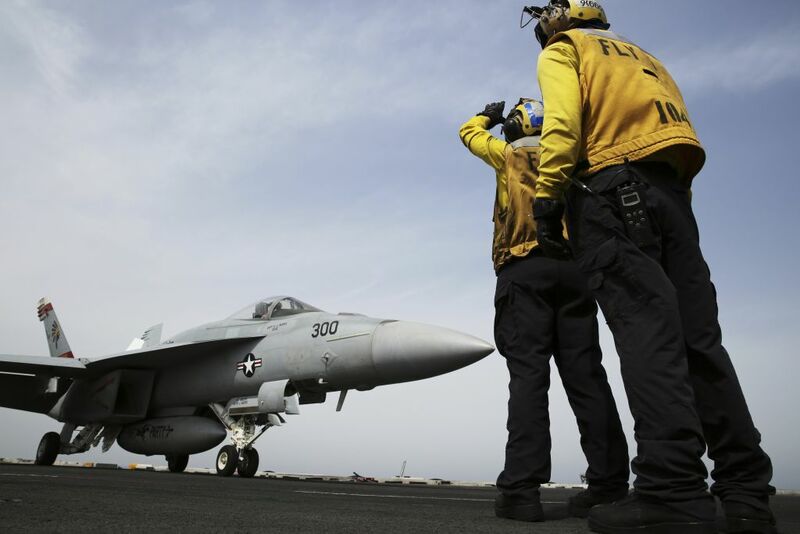 Planes from these ships are regularly flying to each country to bomb Islamic State militants and other targets. From the Nimitz alone, US fighter jets flew missions resulting in at least 350 bombs being dropped on IS militants just in the last month. Iran has routinely challenged US ships and aircraft across the Gulf, asserting at times that the entire waterway is its territory. Navy commanders say Iran’s unpredictable behavior is the biggest safety hazard. To counter the threat, Pentagon experts are searching for new ways to deter, defeat or disable the drones. According to Byrne and Cdr. Dave Kurtz, the Nimitz’s executive officer, Iranian drones fly over the carrier strike group almost daily. Up in the carrier’s control room, a book on Iranian naval and maritime forces sits above the radar screen. Commanders on the ship announce when a drone appears. Then, they go through a careful, planned response of attempted radio calls and warnings. 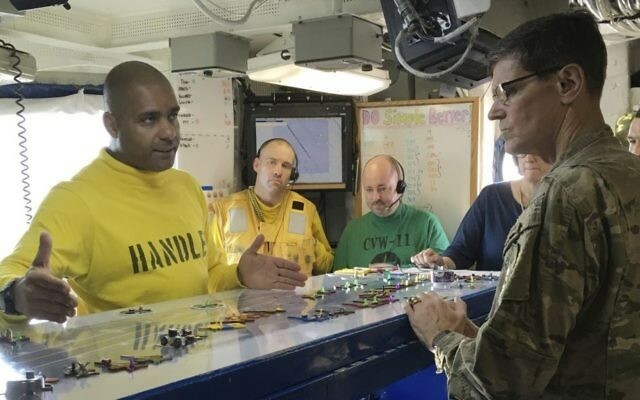 Gen. Joseph Votel, the top US commander in the Middle East, visited the Nimitz on Thursday, also stopping on the nearby USS Vella Gulf, a guided missile cruiser. The drone, he said, also flew over that ship. Much as it did with that decade-old roadside bomb battle, the organization now focuses on how to deal with Iran’s drones, Votel said. He didn’t provide details, but he acknowledged that US cyber capabilities could be used to defeat a drone or the network controlling it. The military is training troops on drone response, he said. But right now, said Byrne, they’re still following their normal procedures. And he still hasn’t been forced to shoot one down. Byrne described how a helicopter from the Nimitz flew by the drone to ensure it wasn’t weaponized. In the month the Nimitz has been in the Gulf, efforts to speak with the drone operators have been hit or miss, he said. “Sometimes they answer, sometimes they don’t,” he said, echoing experiences American forces have had with small Iranian fast boats that pose a similar threat of coming too close by sea. 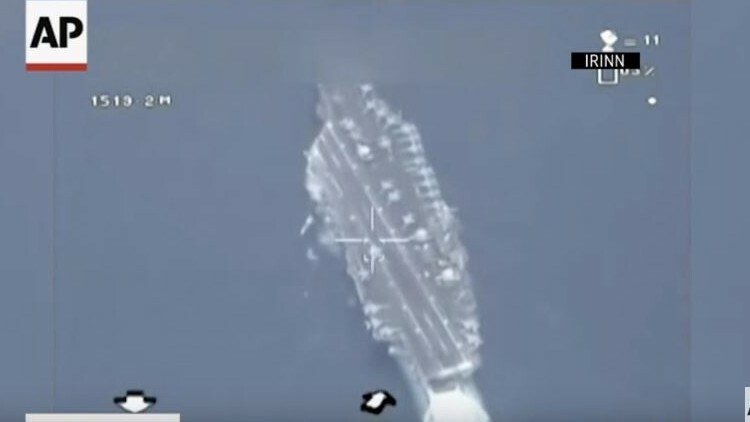 When the Iranians do answer, Byrne said, they often “challenge our assertion that they are flying into danger.” The drones fly out of airfields up and down the Iranian coast, mainly watching US ships and taking photos. 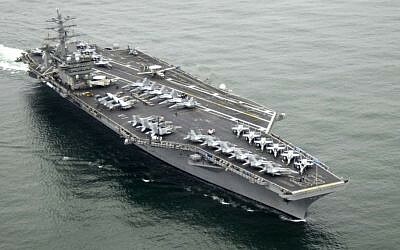 On Thursday, the Nimitz was about 40 miles from the Iranian coast, halfway between the Islamic Republic and Bahrain.